Put the apple slices in a pan with the icing sugar, cardamon, and the juice from the two lemons. Bring to a boil with the lid on and allow it to simmer for 2-3 minutes. Mash the compote using a whisk and cool. 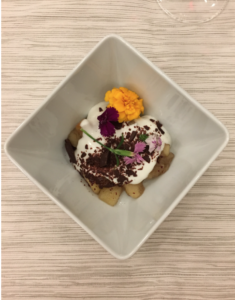 Save the apple compote and skyr topped with the coarsely chopped dark chocolate.